The first few months of a baby's life are always the toughest... for the parents, that is. No matter how experienced you are, how prepared you are, or how much outside support you have, the first few months are always the most trying times for parents. Probably even more so for moms who may be sleep deprived and stressed out. For parents that have to deal with baby colic, the non-stop crying can be very nerve wracking. Some of the best advice we've received and learned through our own experiences is that take help whenever it's offered; switch with your partner or put your baby down and walk away if you're losing your temper; sleep when your baby sleeps; and the most helpful thing is to try to establish a daily routine with your baby as soon as possible. We were very fortunate to be blessed with calm and healthy babies and they didn't cry all that much. Even so, at times, things got very tiring and stressful. I'm also very grateful that my husband is so supportive, and has a great set of hands that when I can't calm our babies down, he takes over and is able to settle things down, and bring some order back into our lives. An average baby at 21 weeks should weight around 15 to 15 1/4 pounds and measure around 25 to 25.5 inches. By this time, hopefully things are moving along smoothly, and you have developed a good handle on taking care of your baby. And if possible, continue breastfeeding your child, and keep foods that can cause allergies away from your baby such as cow milk, honey, nuts, egg white, and chocolate. By this time, your baby has much better sight and hearing. He or she begins to hear more sounds, and is better able to distinguish the different sounds we make in our speech. You may also notice that your baby tries to mimic sounds and babbles different simple sounds such as ga-ga, ba-ba, da-da, and ma-ma. 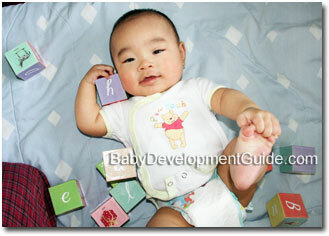 At the same time, your baby's movement are much more controlled with greater hand and eye coordination development. 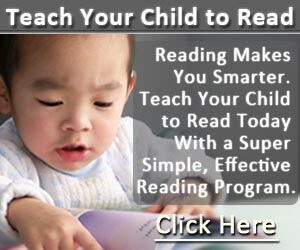 While lying on their back, your baby may like to grab on to their toes and feet, or grab on to their own hands and fingers and study it in amazement. Your baby is also much more adept at picking up and holding on to small objects, and is able to transfer the object from one hand to the other. Your baby is also developing his or her personality during this time, and begins to know what they like and dislike. With actions that they like and enjoy, they will show approval, and with actions that they dislike, your baby will push away and protest. Sometimes, if you take away a toy that your baby is having fun with, he or she will protest and let you know he or she is unhappy about it. Take time to study your baby, and you'll quickly find out that he or she likes or dislikes.